While five-year-old Ashya King undergoes treatment in a Spanish hospital for a stage four brain tumor, his parents Brett and Naghmeh sit in a Spanish jail. Their crime? The Kings wanted their son to have proton beam therapy, a cancer treatment that is considered to be safer than traditional radiation but that is not yet provided in the United Kingdom for anything other than the treatment of ocular malignancies. Ashya, however, has an aggressive brain tumor called a medulloblastoma which is known to quickly metastasize to other areas of the brain and to the spine. According to an MSN UK report, father Brett said that when he continued to push for his son to have access to the proton beam therapy, doctors and administrators at the hospital threatened to get a protection order for his son and to ban him and his wife from visiting the oncology ward where their son was going to be receiving traditional treatments. Ashya’s parents took matters into their own hands and moved their son from the United Kingdom to Spain in hopes of getting him the treatment they feel he needs. Medulloblastomas are the second most common brain tumor affecting children, and children are ten times more likely to have the tumors than are adults. While Brett and Naghmeh sit in Spanish jail, waiting for the authorities to decide whether they will be extradited to the United Kingdom, their five year-old son undergoes at-this-time unspecified treatment without his parents by his side. The bureaucratic process which turned these concerned parents into fugitives from the law for wanting proton beam therapy for their son uncovers the messy intersection between parental rights, the regulation of approved medical procedures, and insurance companies’ controls over medical care. Countries like the United States, Switzerland, and the Netherlands that embrace proton beam therapy use it to treat malignancies found in the brain, the central nervous system, the head and neck, and non-small cell lung cancer. Other areas suitable for proton beam therapy include cancers of the breast, liver, pancreas, cervical area, prostate, soft tissue sarcomas, and specific pediatric applications, including brain tumor like the one from which Ashya King suffers. IBA is a company headquartered out of Belgium that controls 51 percent of the proton beam therapy market. Their company video embedded below explains how the therapy works. Conventional X-ray radiation treatments whose photons which pass through all body tissues on their way to the affected area. Their reach is scattered, effecting surrounding tissues. Proton beam therapy, however, benefits from a physical property called a Bragg peak which enables protons to be delivered directly to the site of the tumor without affecting the tissues around it. This makes the proton beam therapy more accurate in its target and able to destroy the tumor “pixel by pixel” without destroying surrounding tissues. Andrew L. Chang, M.D. is a Proton Radiation Oncologist with the Pediatric Proton Foundation. In a video addressing the application of proton beam therapy in children specifically, Chang says, “The concern about children is that children themselves are more sensitive to the effects of standard radiation therapy. Children’s bodies are still developing,” Chang says, “and one of the known side effects is that radiation slows down the growth and development of anything it touches.” In the incidence of traditional radiation to the brain tissue of children, Chang says that the long-term effects on cognitive ability can be heavily impacted by traditional therapy, a negative side effect that can be avoided when childhood brain tumors and cancers can be treated instead with proton beam therapy. Despite the side application of treatments in other countries, proton beam therapy is not yet approved in the United Kingdom though the National Health System (NHS) will approve of its wider use starting in 2018. Currently the country’s nationalized health plan does not cover the therapy though the NHS selects a small number of patients to be sent for treatment to other countries that do offer the treatment. Ashya King was not going to be selected to be one of the patients eligible for treatment overseas. Patients not chosen by the NHS must shoulder the costs of the proton beam therapy themselves if they want the treatment. Because this is 2014 and the Kings took matters into their own hands to get proton beam therapy for their son, they are facing potential criminal charges. 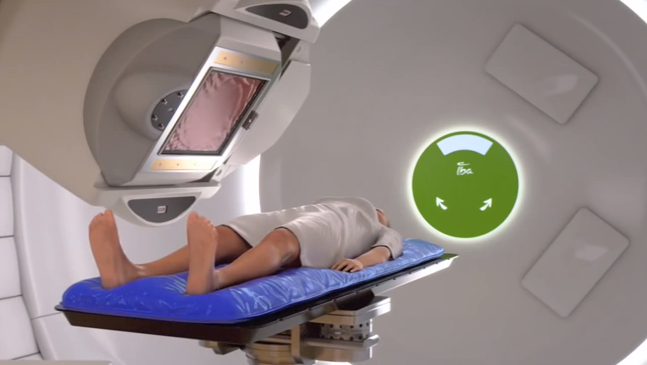 One Response to "Proton Beam Therapy Provides Alternative to Radiation Treatment [Video]"